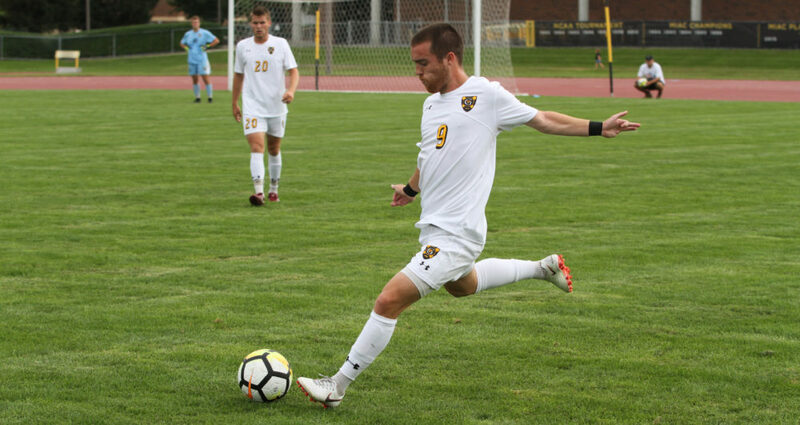 DECORAH, Iowa – The Gustavus men’s soccer team suffered its first setback of the season in a 3-0 loss Friday night at Luther. The Gusties move to 2-1 overall, while the Norse improve to 4-0. Luther scored what proved to be the game-winning goal 8:33 into the match on a header goal. The Norse upped their lead less than a minute later on a shot from midfield. And in the 15th minute, the home squad scored its final goal of the game on a shot from directly in front of the net. Despite the early goals, the Gusties settled down defensively and allowed only six more shots the rest of the game. The Norse outshot the Gusties 9-5. Matt Bateman (Sr., Savage, Minn.) took his first loss of the season in a complete-game effort with two saves. “It was important to play a lot of guys against a top class team before the conference starts, and Luther is exactly that,” Flinthams said. “They’ve been building toward this season specifically and have a really gifted senior class. Obviously you see that when three of them punished us with a quality moment of skill and experience. Gustavus stays in Iowa and travels to Wartburg for a 6 p.m. match Sunday.